Safe Mode is used when the operating system fails to boot in to the normal mode. Since Safe mode starts Windows with limited set of services and drivers, it’s used to troubleshoot Windows especially when Windows fails to boot after installing new drivers or third-party programs. For instance, if the PC fails to boot after installing a new driver or program, one can boot into to the Safe mode and remove the driver or program to fix the issue. Those of you have ever used Safe mode to install or uninstall a program would know that Windows doesn’t let you install or uninstall some programs by default. This is because, Windows Installer service doesn’t run in the Safe mode by default and programs that require this service to be running show errors when you attempt to install or uninstall them. When you try to uninstall a program that requires Windows Installer service via Programs and Features in Safe mode, Windows will show “The Windows Installer Service could not be accessed. This can occur if the Windows Installer is not correctly installed. Contact your support personal for assistance” error. Please note only programs that require Windows Installer to be running give this error. 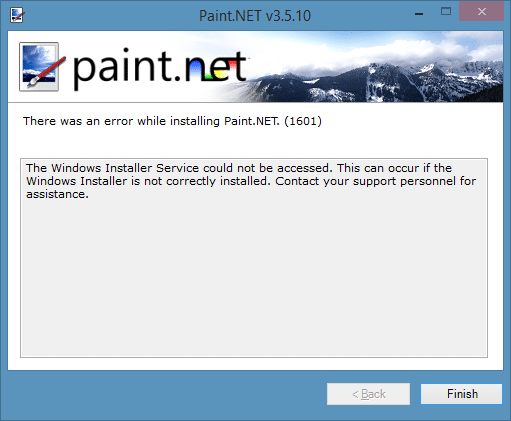 For instance, the popular Paint.NET program requires Windows Installer and can’t be installed or uninstalled when the service is disabled. 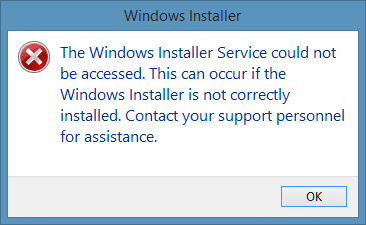 Using the Services program to start the Windows Installer service won’t help either. When you try to start Windows Installer service under Services, Windows will give you “Windows could not start the Windows installer service on Local Computer. Error 1084: This service cannot be started in Safe Mode” error. In order to start the Windows Installer service in the Safe mode, you need use a tiny third-party tool named SafeMSI. The cool thing about this software is that you can run this software when you are in the Safe mode to enable Windows Installer service (it doesn’t require Windows Installer service) and it’s compatible with all recent versions of Windows, including Windows 8 and Windows 10. Step 1: Download SafeMSI tool from this web page on a working PC and copy the software to a USB drive. Note that if you have booted into Safe mode with networking, you can download SafeMSI on the same PC without having to use another computer. Step 2: Connect the USB drive containing SafeMSI to the PC that you have booted in to the Safe mode and then double-click on the SafeMSI tool to enable Windows Installer service. Note that you must run the SafeMISI only after booting in to the Safe mode. If you’re on Windows 10, refer to our 5 ways to start Windows 10 in Safe mode guide. 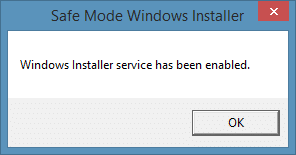 Step 3: You can now try to install or uninstall the program that require Windows Installer service. That’s it! Would this allow me to install an XP program that worked under Windows 10 (upgraded from Windows 7) but cannot be reinstalled after I did a complete refresh of Windows 10? You need to boot in Windows 10 in Safe Mode, then you need to follow the command pompt above to enable Safe Mode Un-Installer. Remember the HP Protect Tools has other features to delete first. HP Protect tools device access Manager. its not working with me ever …..